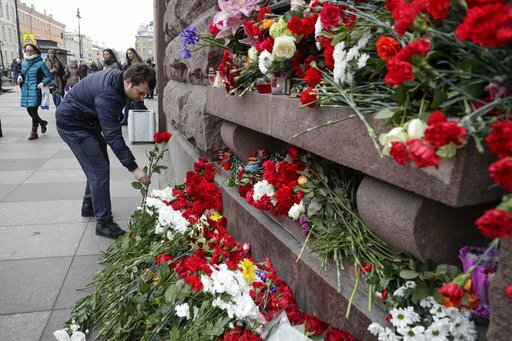 ST. PETERSBURG, Russia (AP) — A 22-year old suicide bomber born in the former Soviet republic of Kyrgyzstan was behind a blast on the St. Petersburg subway that killed 14 people, Russian investigators said Tuesday. 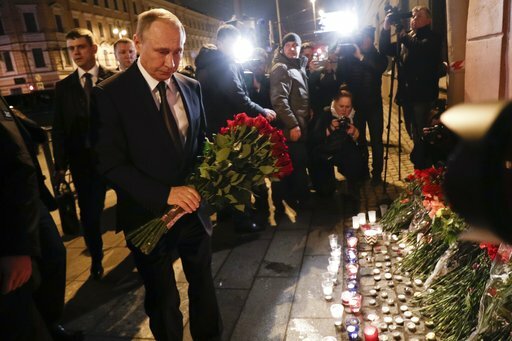 There was no immediate claim of responsibility for the Monday afternoon attack, which came while President Vladimir Putin was visiting the city, Russia’s second biggest and Putin’s hometown. Russia’s health minister on Tuesday raised the death toll from 11 to 14 and said 49 people are still hospitalized. Authorities did not say whether the suicide attacker was included in the death toll. The City Hall said there were several foreign nationals among those killed and injured, but would not offer detail. The foreign ministry of the Central Asian nation of Kazakhstan said one of its citizens has been killed in the attack. Residents have been bringing flowers to the stations near where the blast occurred. Every corner and window-sill at the ornate, Soviet-built Sennaya Square station on Tuesday was covered with red and white carnations. Russian investigators on Tuesday said the bomb was set off by a suicide bomber and identified him as Kyrgyz-born Russian citizen Akbarzhon Dzhalilov, who turned 22 two days before the attack. The Investigative Committee said that forensic experts also found the man’s DNA on the bag with a bomb that was found and de-activated at another subway station in St. Petersburg on Monday. In Kyrgyzstan, the State Committee for National Security confirmed the man’s identity and said it would help the Russian probe. The Interfax news agency on Monday said authorities believe the suspect was linked to radical Islamic groups and carried the explosive device onto the train in a backpack. The entire subway system in St. Petersburg, a city of 5 million, was shut down and evacuated before partial service resumed six hours later. Typically crowded during the rush hour, the subway on Tuesday morning looked almost deserted as many residents opted for buses. Monday’s explosion occurred as the train traveled between stations on one of the city’s north-south lines. The driver appeared in front of reporters on Tuesday looking tired but not visibly shaken by the events of the previous day. Alexander Kavernin, 50, who has worked on the subway for 14 years, said he heard the sound of a blast while his train was running, called security and carried on to the next station as the emergency instructions prescribe. The decision to keep moving was praised by authorities, who said it helped evacuation efforts and reduced the danger to passengers who would have had to walk along the electrified tracks. Oleg Alexeyev, 53, who trains sniffer dogs for the police, went to the Technological Institute station Tuesday morning to lay flowers in memory of those who died nearby. Four stations on the subway were closed again Tuesday due to a bomb threat, but later reopened. People from Kyrgyzstan and other Central Asian former Soviet republics are common sights in St. Petersburg, home to a large diaspora of migrants who flee poverty and unemployment in their home countries for jobs in Russia. While most Central Asian migrants in Russia hold temporary work permits or work illegally, thousands of them have received Russian citizenship in the past decades. Russian authorities have rejected calls to impose visas on Central Asian nationals, hinting that having millions of jobless men across the border from Russia would be a bigger security threat. Patriach Kirill, head of the Russian Orthodox Church, led a service at Moscow’s main cathedral on Tuesday for those killed in the blast. “This terrorist act is a threat to all of us, all our nation,” he said quoted by the Interfax news agency. In the past two decades, Russian trains and planes have been frequent targets of attack, usually blamed on Islamic militants. The last confirmed attack was in October 2015 when Islamic State militants downed a Russian airliner heading from an Egyptian resort to St. Petersburg, killing all 224 people on board. Separately, in the southern Russian city of Astrakhan, two policemen were killed in the early hours on Tuesday in a suspected Islamic militant attack. Alexander Zhilkin, governor of the region, said the attackers are on the run. Vasilyeva reported from Moscow. Leila Saralayeva in Bishkek, Kyrgyzstan, and Iuliia Subbotovska in St. Petersburg, Russia, contributed to this report.